Take the raw rice and toor dal in a mixie jar and grind it like rava. It should not be too coarse, remember. Set aside. Alternatively you can soak the rice & dal for 2 hours, drain the water and grind it. Now in a broad kadai , temper all the items given above in the same order. Add 2 cups of water and the required salt. Allow it to boil.Now add the ground rice mixture.Mix well for sometime without forming lumps.Let it thicken. The rice absorbs all the water and becomes a non sticky dough. Lastly add freshly grated coconut (optional) and pepper powder.Mix well. Let it cool down. Now grease the idli plate with little oil. Make balls out of the dough and arrange it in the greased idli plate.Steam the balls for 10-15 mins. Soft , hot upma urundai is ready to serve. We enjoyed with the sambar I made for lunch. U can have it with any chutney. Sometimes this can be served as an evening snack without any accompaniment. love your header...the urundai looks tempting. Totally new dish to me....sounds and looks delicious! 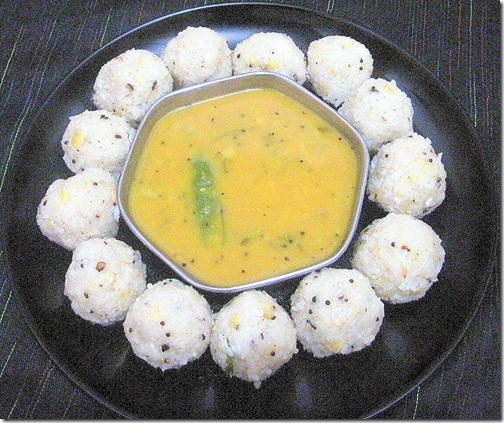 I make this too but I smooth grind the batter to idli maavu consistency. will try this next time. Nice urundai.Pics are good.We also prepare this but in a bit different manner. 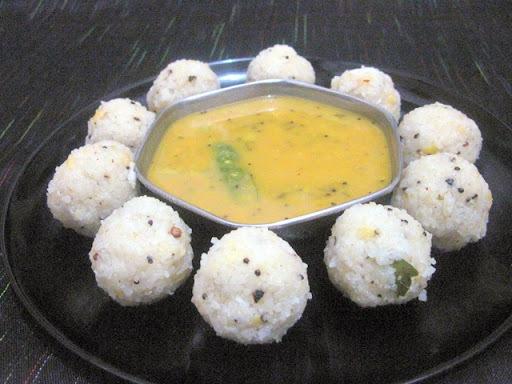 Definitely a twist to the traditional Upma...atleast to me..Love it with Sambar. Nice recipe...looks absolutely yummy...nice presentation.